As any techno-cultural aficionado will enthusiastically tell you, the 21st century is the century of "convergence", in which the communications industry progressively rolled out its own rendition of the Swiss Army knife: pocket-sized, hand-held, wireless devices which function simultaneously as movie and music players, mobile phones, gaming engines, internet connectivity devices, still image and video cameras, musical instruments, calculators...with so many functions now capable of being handled by little equipment and energy expenditure, visions of the future both Utopian and dystopian have flown off the shelves at a hitherto unprecedented rate (and wireless electricity is just around the corner as well.) Prophesies abound that this synthesis of communicative modes and cross-pollination of technological functionality is a stepping stone towards realizing some kind of fully-integrated Übermensch; eventually our ability to communicate with and comprehend each other will accelerate to the point where humans morph into sophisticated telepaths. More grandiose yet, there are the fantasies of some ultimate "awakening" along the lines of the "Omega Point" suggested by rogue priest Pierre Teilhard de Chardin, an ultimate synthesis of human intelligence with cosmic consciousness -- the inventor Ray Kurzweil calls the same "universal awakening" phenomenon the "Singularity," albeit with a much more technophiliac gloss to it. It is somewhat interesting to note that, despite the admirable efforts of software and hardware designers to create new means of simulating the synesthetic experience, one quite successful method was discovered over a half-century ago, without the aid of any computer equipment. 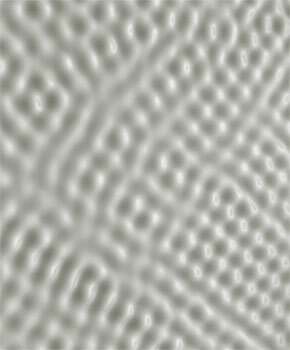 Dr. Hans Jenny, the father of this method, named it cymatics (from the Greek word for wave, "kyma".) Jenny's studies in wave phenomena, their kinetics, and their dynamics are sadly overlooked or unknown by most practitioners of electronic music -- only two volumes of Jenny's studies are currently in print -- but the conclusions drawn by his research into phenomenology would be well worth looking at again, as we collectively lurch towards the discovery of more accurate light and sound synthesizing machines. Dr. Jenny's method now seems almost laughably simple, a low-budget form of scientific rigor when viewed in the light of the tools mentioned above. Jenny would place substances such as sand or viscous fluids on a metal plate, which was in turn attached to an oscillator controlled by a frequency generator. The plate would amplify the vibrations of the oscillator, and, as the tones produced by the frequency generator were raised or lowered, different patterns would appear in the previously stationary materials: almost without fail, higher frequencies would produce more intricate and elegant patterns in the vibrating piles of sand, gelatin, or whatever other material Jenny was using at the time. The current publisher of Jenny's studies admits to his awe when seeing a small pool of glycerin reveal a "snake" while under the influence of sound waves and some strategic lighting. In these experiments, the tendency of the higher frequencies to 'sculpt' forms with spiritual connotations, such as complex mandalas or yantras, eerily approached Arthur Schopenhauer's personal philosophy of frequency: namely, that higher tones corresponded to a striving toward superhuman greatness while the lower, almost inaudible tones corresponded to the inorganic: the planet's lifeless and will-less forms and masses. Jenny's line of thinking follows Schopenhauer, in that density or heaviness, manifested in bass tones, represented physicality, while flights of thought and emotion were manifest in 'lighter', more evanescent, higher tones. Jenny's own will was being crystallized by these cymatic experiments: his desire to display to others a 'unitary phenomenon,' a more holistic way of perceiving, bore more convincing results than his meager present-day fame lets on. His primary concern was with demonstrating nature as a "triadic phenomenon" of periodicity, shape and dynamics, not with simulating synesthetic experience -- although the latter has seemingly come about as an unintended consequence of researching the former. Seeing that changes in the vibrational field were the fundamental cause of changes in natural phenomena, it was not difficult to at least try and detect some correlation between sound and visuals. Younger proselytizers of Jenny-ism exist in the upper echelons of 21st century art, as well. One artist with both feet firmly planted in the cymatic, or at least synesthetic, mode of music creation is the ambitious and critically lauded Carsten Nicolai. Nicolai's most "Jenny-centric" work is probably Milch from 2000 -- true to its title, the piece involves pools of milk being subjected to imperceptible audio frequencies from 10 to 150 Hz, causing the liquid to reconstitute itself into a number of different irregular patterns: concentric circles at the lowest frequencies and densely-packed masses of quivering goose bumps at the slightly higher ones (some of the visual results have since been used as the cover artwork for one of Nicolai's CDs, For, recorded under his Alva Noto alias.) 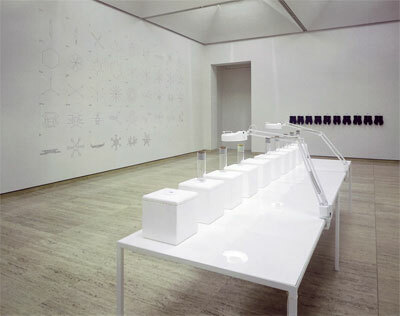 Cymatics are a motif that Nicolai has returned to time and time again in his work, including the 2001 piece Wellenwanne and the captivating Snow Noise: for the latter installation piece, gallery visitors approach a set of 3 glass cylinders aligned in a row and placed atop 3 identical white boxes containing cooling units. Almost instantaneously, snow crystals begin to form as random noise generators provide the soundtrack to this transformation of matter. The congruence between the irregularities of the tiny crystals and the random attacks of audio "fuzz" is startling, even though we have been inundated with cultural references (white noise or television static as "snow", etc.) pointing at this relationship before, and often took it for granted. "As a visual artist Nicolai seeks to overcome the separation of the sensual perceptions of man by making scientific phenomenons [sic] like sound and light frequencies perceivable for both eyes and ears. 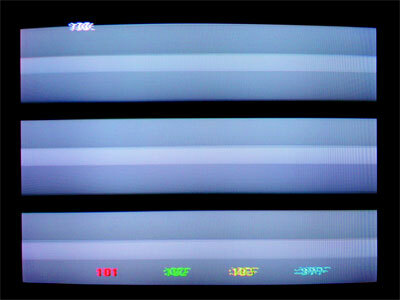 His installations have a minimalistic aesthetic that by its elegance and consistency is highly intriguing." Nicolai's host of professional accolades, among them a couple of 'Golden Nica' awards from the Prix Ars Electronica festival, attest to his above-average skill in synchronizing sensory information, sculpting it into forms whose clarity and sense of purpose are not overwhelmed by their cold artificiality (he has occasionally been referred to as a "plastician," a suitable designation given his liberal use of manufactured plastics as contextual framing devices.) Among his more talked-about works are the 1998 installation Bausatz Noto, a row of four Technics turntables each adorned by a translucent sperm-white slab of vinyl containing a number of locked grooves. Bausatz Noto succeeded on multiple levels: as a merely visual artwork and as a participatory experience, in which anything from one to four patrons could enact a concert on the turntables, no two being exactly alike. The piece contains rhythm both in a musical sense, generated by the interlocking sound loops selected by the players, and an architectural rhythm as well, with its even spacing and forceful symmetry. It is the kind of piece that could would turn off fans of rococo eccentricity in an instant, but it can't be denied that it is beautiful in a sense: by Le Corbusier's definition ("when a thing responds to a need, it is beautiful"), Bausatz Noto succeeds. If we understand the desire for restraint and clear definition to be a pressing need in a time of perplexing clutter and clatter, then the beauty of Bausatz Noto follows. Although Nicolai is far more involved with computers than Hans Jenny ever had a chance to be, both Jenny and Nicolai rely on electricity to reach their conclusions about the unitary nature of perceptible phenomena: Jenny worked largely with piezo-electric amplifiers in his experiments, while Nicolai uses a full complement of electric equipment, from the voltage-controlled oscillators and filters on vintage analog instruments, to the now-omnipresent silver Powerbooks and MacBooks. Nicolai's use of electricity as an illuminator, in both the literal sense and a psycho-spiritual one, is evident in his appropriation of Thomas Edison's middle name for his alias, Alva Noto. Under the Noto banner (minus the Alva), one of Nicolai's most novel releases -- and one most pertinent to synesthetic study -- appeared under the name Telefunken in 2000. Telefunken, a humble little tool for developing image-sound correspondence, embodies many of the more engrossing aspects of 21st century digital art: namely, the chance for a non-artist to complete the work on their own, the possibility for the perceived results to differ depending on variable factors like the quality of one's equipment (Nicolai personally recommends a Sony Black Trinitron TV for best results), and non-interference by the artist himself. The Telefunken CD is intended to be placed in a CD player which is hooked up to a television via its S-video and audio jacks; with the audible frequencies from the CD -- sounding in a range from 50-8,000 Hz -- determining the visual output on the television screen. Anyone who has experimented with video camera feedback by pointing it at its output monitor -- creating undulating, vertiginous tunnels of white light and explosive bursts of white flak -- will be intrigued by the results. Like said phenomenon, the results also bear similarities to the reality-deforming nature of Op art pieces, striving to escape the confines of the two-dimensional with their insistent 'hyper-visuality.' The micro-sized tracks on Telefunken (only a few seconds in length, and thusly to be treated like the digital equivalent of 'locked grooves') have more in common with shortwave radio noises than with anything noticeable to the average individual as "music." To be sure, they are a world removed from the ecstatic and overflowing symphonies of Scriabin (despite the 'Nicolai' which is shared between the two artists), but they do represent a fascinating step forward in the search for audio-visual congruence. As with Jenny's cymatic experiments, the audible frequencies on Telefunken create rippling and strobing patterns rather than mere solid colors, and the work as a whole points to the larger role that machines will eventually play in determining the vocabulary of this language. The concept has caught on well enough that it has undergone several permutations as an installation, finally appearing on LCD flat-screen monitors in 2004. Nicolai encourages us that "the standards of the new technology permit new visual interpretations with the same set-up, expanding the acoustic and visual spectrum of the installation substantially." The work of Nicolai, and the handful of other artists mining this same territory, begs the question: would an ability to, say, 'hear color' and vice versa, distributed among a wider section of the general populace, precipitate a positive change in our daily dealings with each other, owing to a newfound hypersensitivity to our surroundings? It is nice to fantasize about a new humanity whose higher-evolved sensory apparatus contributes to a deeper awareness of, and interaction with, the phenomenal world. Yet with the studies in this field just now gaining recognition as being something more than pseudo-scientific, there is clearly a long way to go. The gulf between inherited and adventitious synesthesia is one problem to deal with; and even among these 'adventitious synesthetes' there is such a formidable difference in social backgrounds, education and preferred artistic style, that developing a normative aesthetics is no mean task. On the other hand, all is not total randomness in this area either. If that were the case, then there would be no international standard for things like warning signs. We could expect, upon traveling to another country, to encounter traffic signals where we "stop" on a brownish light and "go" on a purple one. In situations like these, which require the most urgent attention, some very rudimentary color-sound connections are already in place -- televised warnings for incoming storms almost invariably pair high-pitched beeps or whines with flashing red or yellow graphics and text. Such examples suggest that there are already some 'cultural universals' in place, at least as far as the more primal human behaviors (the 'fight or flight reflex,' in the case of audio-visual warnings) are concerned. The challenge now -- the one that Nicolai and others seem to be taking up -- is to apply these connections to far more nuanced forms of information. Thomas Bey William Bailey, born 1977 in Madison Wisconsin, is a multi-disciplinary artist with heavy emphasis on sound, and a pervasive interest in the problems of 'saturation' / 'congestion' culture as well as the Utopian impulse. He has previously been based in Chicago, in several urban centers of Japan and in Central Europe, with an eclectic variety of performance, recording and installation activities taking place in each region. His reduction of uncomfortable personal defects to pure, 'neutral' audial phenomena has been one recent aspect of his work: he has recorded a CD of electronically-manipulated sounds resulting from asthmatic breathing, and participated in a Stockholm installation in which the sounds of his sleep-talking were brought front and center. His other work includes co-production of some episodes of the Chicago experimental radio program Blind Spot, as well as submissions to electronic arts festivals, such as Madrid's 'Punto y Rayas' exhibit of short films and Istanbul's 'ctrl-alt-del' festival. 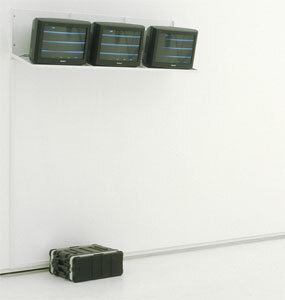 Thomas' interest in sonic culture and 'unpopular' culture has prompted pieces of investigative journalism for magazines such as The Wire, His Voice, Static and Hz- these efforts have most recently been condensed into his first non-fiction book, Micro Bionic: Radical Electronic Music and Sound Art in the 21st Century. Regular updates are available at his personal website, www.belsona-strategic.com.